Opponent is unknown. What is the best play on turn,fold or call? We'll see what the others think, but I'm going to check the turn behind. My hand is only worth really 1 street of value, so if the river checks to me, then I'll make a thin value bet. When I'm way ahead or way behind, I'm trying to get to a showdown. I mean he checks twice,so he doesn't seem too strong. But he could have some pp that trying to get to showdown as cheap as he can. And against NL2 random it could have 2 street value. So that's why i'm opening it on the turn. Could someone help me and explain why Cbetting the flop isn't everyone's choice. If he has the Q you are likely to end up calling a bet from him somewhere down the line anyway. In my mind I want to give him the chance to fold and not give a free card to his middle pairs or straight draws. We might have just let him hit his 77. What am I missing? To answer the question I'd fold the turn. 1. This is the perfect card to balancing your x-back range. You probably x-back with TT JJ and KK on this board,so you have to be at least some TP type hand to not to be exploited. 2. 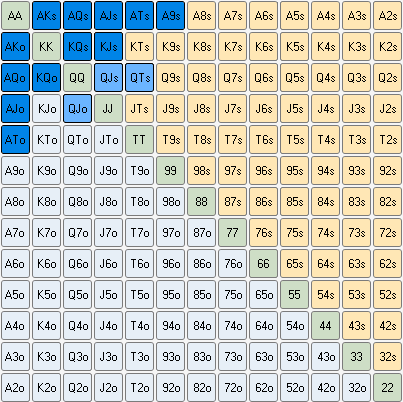 You blocking any straight draws with the K kicker,but mostly his utg open and 3betcall range is not containing any of that type of hands. He is calling either an Ax or some pp in this situation. Both against i'm truly leading,excluding the QQ and AQ. Probably against this will not have more than 2 street value,so it's completely fine to check in here,and let him to bluff himself in the pot. Last edited by Taurus221; Wed Jan 02, 2019, 04:24 PM. 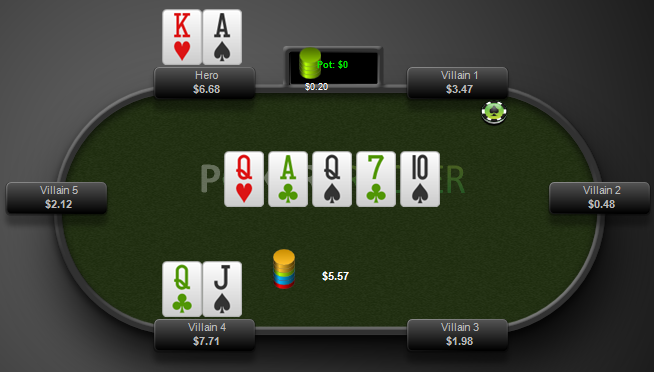 If you cbet this flop what worse hand do you think will call ? I think most worse hands will fold, because the flop hits your 3betting range , so your not betting for value on the flop , your not betting as a bluff because a better hand will not fold , so a check looks best, you could bet for protection against hands like you mentioned , but they are drawing to few outs that checking looks our best option on the flop . I agree... nothing better folds, worse won't call, so a c-bet just value owns us. In my opinion. This is 2NL. Unless you have a read that opp is a reg, you should not be worried about balancing your check-back range or being exploited. It is good that you have this thought process, but save it for when you move up in stakes. I would bet the flop, but I can accept the arguments for checking. I think you should check the turn and bluff catch a reasonable size bet on a blank river. If he checks to you then bet thin for value, but you would likely be folding to a raise. This is an unknown opp at 2NL. 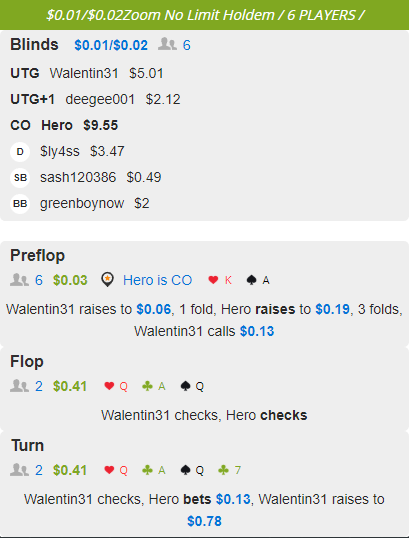 No, you should not call that turn raise; fold. Miller rule #2 - when an unknown villain bombs the turn or river, fold. I'm checking the flop here as well. I like the turn bet here to protect vs clubs. I would bet the turn and river here... as played fold the turn vs this check-raise. Oh right,i forget this thread. I decided to call this,because i can't put too much Qx in his hand (AQ board and me blocking 1-1 A,KQs i'm blocking 1 K,anything less probably not calling my 3bet oop). I thought he have more Ax in here like AK AJ AT or even A9s. River was a Ts,and he bet pot,what i'm still called,the only hand what completed this river(and could play like this) is a KcJc. I tried to figure out the worse case scenario here,and because i'm underreped my hand,i can't put out all the Ax from his range,so if he have a reasonable amount of Qx in here it will be compensated by the Ax (in my calculation). I think you are ranging your opponent way too wide here. Obviously, the villain is bad and called with QJo but I would use this range for UTG raise then flat (QQ-99,AQs+,KQs,AKo). Now when the villain raises, here's their raising range. (QdQc, AdQd, KdQd, KcQc). We're dead on the turn. I think you missed the dynamic in this hand. The villain is UTG and we are in the CO.